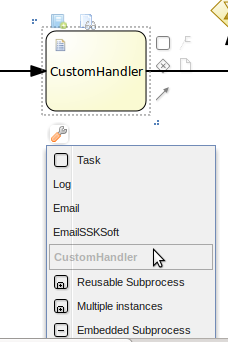 How do I register the workitem handler if I have both human tasks and mail tasks in my process? I have tried that Demian. It doesnt work. It just takes the Human Task handler and ignores the other one. I try EmailWorkItemHandler, it work. Or you have custom emailhandler? you have some error when register your custom email handler? Thanks for your response. But this thing doesnt work with the EmailWorkItemHandler either. This is the code I use to start the process. I dont face a problem starting the process. There is one human task followed by one mail node in my process definition. I complete the task and it gives me No handler found for Email exception.